Arcadia Station on First Street in April 1951. Santa Fe train No. 45, a westbound mail and passenger train from San Bernardino to Los Angeles, awaits departure. Agent Mrs. John McCoy and family at the Arcadia Station circa 1900. Notice the gingerbread type architecture, the spires and the open area at the left which is now enclosed. The Santa Fe Station from Arcadia, California was built in 1887 and is a classic example of the architecture of that time period. It also provided a spiral stairway in the tower to a second floor room where the railroad agent Mrs. John McCoy lived with her family. It was first located at First Street and St. Joseph, south of the tracks, but was moved directly north of the right-of-way in 1923 to allow for enlargement of trackage at its former site. This Station witnessed the daily passing of Santa Fe’s finest trains but due to the construction of the 210 freeway, it became obsolete. This depot was donated to our society in 1969 and was moved to our original site at the north side of the fairgrounds. In 1989 the depot was moved to its present site at Fairplex for our visitors to enjoy. The original rail route this depot serviced was the Los Angeles & San Gabriel Valley Railroad build in 1883. This line went from Los Angeles, through Pasadena to Duarte. In 1886 the line was sold to the Santa Fe Railway and they extended their tracks from San Bernardino (which they had reached in 1883) to Duarte to create a connection to Los Angeles. At this time the name was changed to the San Bernardino & Los Angeles Railway Company. In 1887 this and other Santa Fe Railroads were consolidated to become the California Central Railway Company. 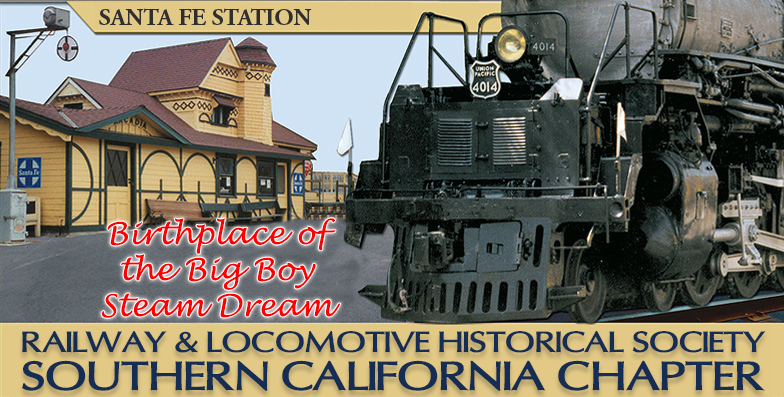 In 1889 more consolidations occurred and it then became the Southern California Railway Company. Finally in 1906 with stock transfers, etc., it officially became the Atchison, Topeka & Santa Fe Railway Company. Various stages of the Arcadia Station’s breakdown and relocation to Fairplex in 1969.